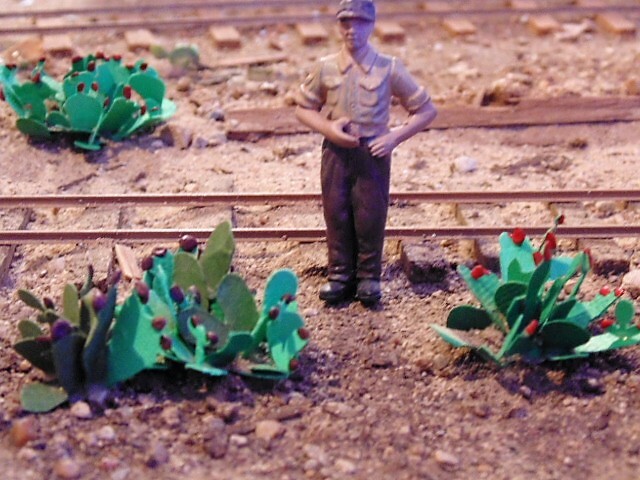 A few years ago, one of the local Freerail-ers-Bobby B, showed me his way of making prickly pear cactus. Bobby used some unusual (for then) hole punches that he bought from the "scrapbooking" area of the local Hobby Lobby and punched some green paper. He then used the punch-outs (a teardrop, a heart, and some other thing) and glued them together in a way that resembled the cactus. These were impressive since the RTR cactus (Plastruct, Woodland Scenics) were very costly and I was modeling an O scale narrow gauge line then. The punch-outs were pretty much HO or O scale size...a bit small for my 1:35 scale efforts. I lost track of Bobby over the years but always remembered his cactus. Modeling the SW USA, cactus of this variety is seen almost everywhere and not just one plant here & there...LOTS of plants all over the place! The punches are very simple to use and I suppose that they will last through several layouts of desert and cactus building. Here's what the punchings look like. Of particular note-the "baby footprints" which can be modified with scissors or sharp Exacto blades to resemble the cactus paddles. The "laurel leaves" parts can be cut apart and glued on to look like the "prickly pear" flowers or maybe new cactus growth on the large paddles (the large cactus leaves are sometimes called paddles). And here is the finished product on the layout. As you can see, the plants are pretty much sized for my scale and would work in O scale or as large ones in S and HO. Now, why would I want to slave over making cactus when all I would need to do is buy some already made and be done with it? Well, since the real things grow in large "clumps" with many "paddles", I would still need to glue a bunch of commercial products together and how much would you think these 3 clusters would cost if I used RTR cactus? Besides, what else do I have to do these days but make fiddly cactus? I still need to "plant" some field grass and other greenery close by but right now, I am very happy with how it is going. Looks like a good way to keep busy, while watching the TV. I am working on stock piling corrugated sheeting for future modeling myself. Along with the odd Rum and Coffee! Those are great! The Mexicans in California in the early days planted prickly pears all over. Your plants are very, very cool. I love outside the box thinking, these fixed budgets for railroads are tough! 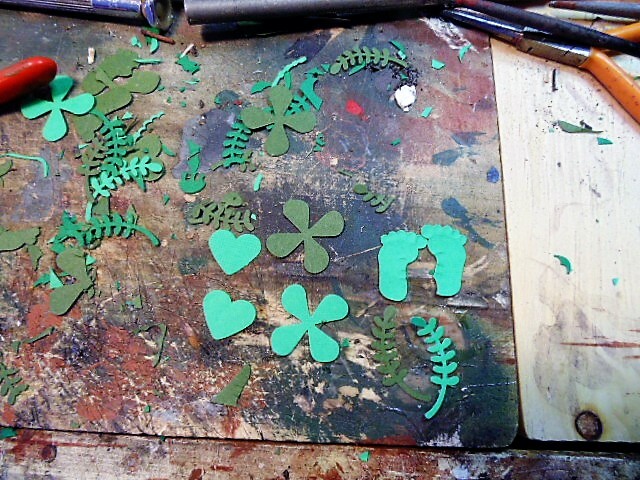 The leafy styleee paper punches are a really C L idea !! I guess your guy isn't there admiring the view though. Probably gonna chop 'em down for his distilling operation ... right ? Yet another entry in my "scrap book of Woodie's ideas" for future reference thanks. Thanks guys. Nope, they don't have teeny little spikes all over them but then there ARE spike-less cactus plants. My old neighborhood had several spikeless cactus plants...probably to keep the upwardly mobile types from sticking themselves! I figger that if I try to make one a day, by 2092 I will have enough to look like what I want. 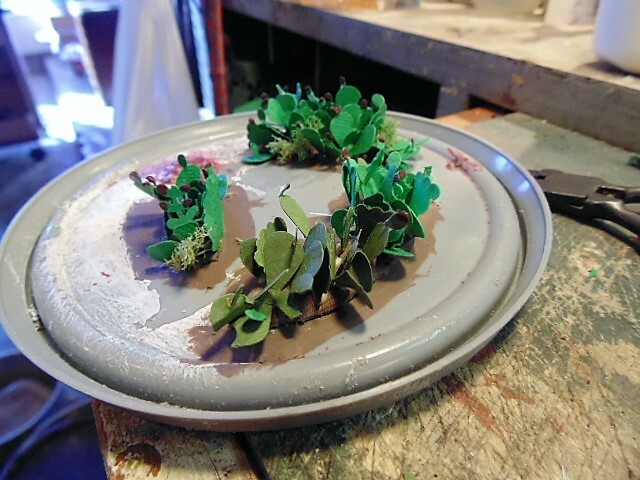 Making a stand of prickly pears takes maybe 30 to 40 minutes and I don't have a tv to watch in the workshop. Besides, I probably couldn't (or wouldn't) make them if I was looking at NCIS or something else. Looking great Woodie - as usual. There are many different "scrap booking" punches at that great store. Others that work well are snowflakes and various flowers. 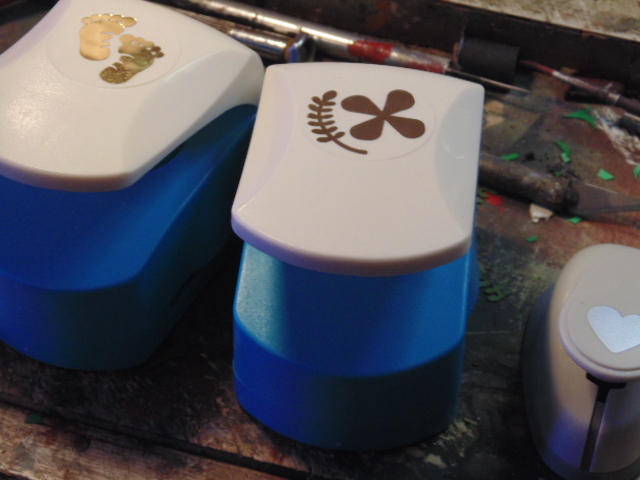 I layer a couple offsetting the leaves on a pin and apply a drop of thin CA. Then I paint with acrylic artists paint. Helps to add texture as well as color variations. Are those grapes that you're hauling in that car? Looks great! Yes they are and thank you for noticing. I spent a bit of time making them for my 2' x 4' display layout "Iron Horse Vineyard". It usually just lingers in the basement now. In addition to the crates of grapes being hauled to the winery, there are bunches in the vineyard. Was a fun build.